This is their genius: They purport to want to fix things, but conservatives aren't looking to make education more rigorous and informative, or science more empirical or verifiable, or voting more representative, or the government more efficient or effective. They just want all those things to reinforce their partisan, ideological, conservative viewpoint. Because in their minds, the opposite of bad isn't good. The opposite of bad is conservative. The opposite of wrong isn't right ... well, OK, but you get my point. It's right wing. Let's stop pretending that concessions to the right will, at any point, sate the beast. Republicans don't critique climate science because of its methods - they hate it because its conclusions reveal the limits of their free-market ideology. If the invisible hand can't solve carbon pollution and government regulations are needed, what's next? Once you admit government can be a force for good, don't you need to admit you also need some taxes to pay for those good things? But instead, reporters constantly look to satiate, pretending Republicans are "skeptics" - merely looking for the best science! - when even denier-in-chief Sen. Jim Inhofe (R-OK) admits the fight is really about his hatred of the solutions. Because "objective" journalism means you can never directly tell your audience that the emperor has no clothes - that would imply you're drawing conclusions when "objectivity" prizes the View From Nowhere. Instead, you must artificially create a he said, she said perspective, such as, "The emperor denied charges by environmentalists that he has no clothes. We'll have to leave it there." Why Aren't Chefs Up in Arms About Global Warming? Climate change is a bigger threat to oysters and clams than first thought, according to a new study. We already knew global warming is hurting shrimp, beef, chocolate, coffee, beer - the list goes on. Why don't you hear more celebrity chefs speaking out about global warming? More concerned about ratings for their Food Network project than protecting the next generation of foodies? Delays in plowing narrow residential streets across the city drew a storm of complaints from residents following the blizzard. Staffing enough permanent crews to handle a blizzard of that magnitude, though, wouldn’t be realistic, Labelle said. “We’ve characterized this last time as a 100-year snowstorm — it would be irresponsible for any community to gear up for that level of storm event,” he said. “Even with contractor services, you’re never going to get city streets open the next day the way people want to see it. We can argue about whether it's worth it to spend the extra money to clear streets faster. 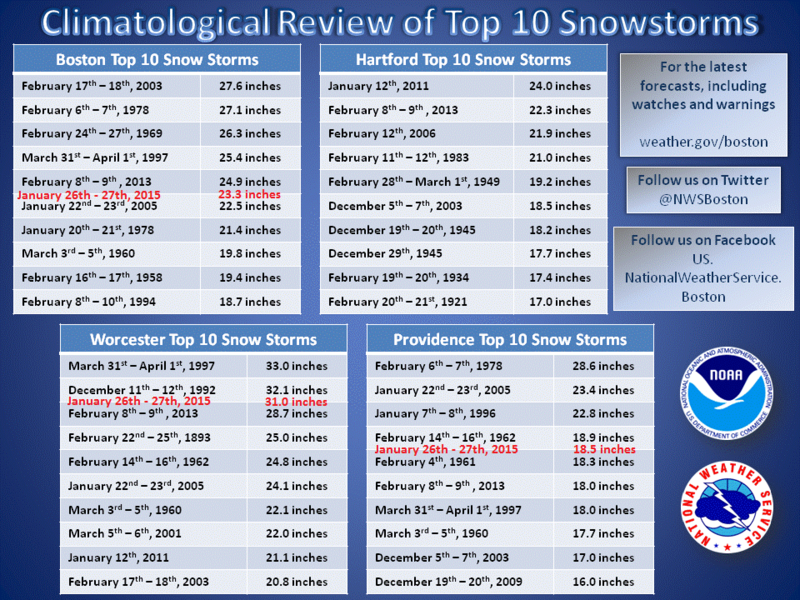 But with worsening winter storms rewriting our record books, the 2015 blizzard is exactly what we should be getting ready to face. It's a similar story in neighboring communities, where austerity takes precedence over preparing for climate-fueled flooding. E&E TV today interviews Peter Glaser, a lawyer for Troutman Sanders, who argues states should simply ignore federal limits on climate-disrupting carbon pollution. I understand that not every interview can be a deep dive into the morality of changing the climate, but do polluter lobbyists always have to get such a free pass for profiting from the damage they're doing to our children's future? The host never even mentions who Glaser represents, but his website tells us he works for "electric utility, mining and other energy industry companies and associations." More specifically, OpenSecrets.org shows Southern Company, a huge coal-fired power company and currently ranked as America's 3rd-biggest polluter, has been Troutman Sanders' number one lobbying client for the last two years and has given them millions in business over the last 15 years. I understand the show is focused on inside-the-Beltway maneuvers & mechanics, and "aren't you history's greatest monster?" could be a little out of place. But shouldn't Glaser have to say something about whether cashing in by selling a slogan of "just say no to cutting carbon pollution" might be just a tad morally irresponsible?